Therese Deveau was born on October 23rd, 1925 in Van Buren Maine. She was one of ten children born to Odilion Deveau and Laura Lajoie Deveau. The family lived on the Cyr Planation, which was in a potato farming area, and relatives tell us that Therese did her share of farm work in her youth. 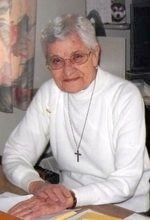 Two of her surviving siblings are Sr Mary Hermine, SMSM and Fr Adhemar Deveau, OMI. Both of them and a number of other family members were present at her funeral on March 13th, despite the freezing wind and snow. Therese entered the Missionary Sisters of the Society of Mary on August 2nd, 1944, in Bedford, Massachusetts. 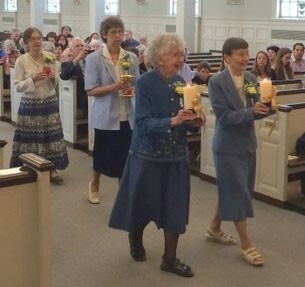 After her first vows on February 2nd 1947, she had a time of community service as cook in Bedford. The following year she was sent to Portland, Maine, to study at St Joseph’s College, where she obtained her Bachelor of Arts degree. On December 8th, 1951, Sister set out for her mission destination of the Solomon Islands. She stopped briefly in Sydney, Australia and gave service for a few weeks at the TB hospital in Killara, before leaving for the Solomons, where she arrived in January 1952. 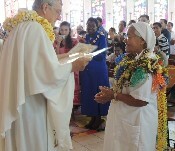 Over the next eleven years she served as a teacher and nurse in various mission stations including Tanagai, Tawka in Malaita, Avuavu and Buma, Malaita. In 1963 Sr Therese was elected as a delegate to the General Chapter in Rome. Afterwards she returned to the USA, where she did a course in Scripture at Boston College and then her Second Novitiate in Bedford. Returning to the Solomons, she served as Regional Superior from 1964 to 1970. In 1971, she was called to Rome to serve as a translator at the General Chapter. In the years to follow she became more involved in the formation of the Sisters in local congregations of the Pacific. From 1972-74 she taught at the Xavier Institute in Port Moresby, Papua New Guinea – a Spirituality Centre for Pacific Island congregations of women. From 1974 -76 she was called to New Caledonia, where she worked on Renewal Programs with the General Council and Novitiate Staff of the Filles de Marie. She was then named Assistant Provincial of the Australian Province and moved to Lavender Bay in Sydney (1976-81). While in Australia Sr. Therese also coordinated the Long Term Spiritual Renewal in Coogee, New South Wales. In 1981 Sr Therese returned to the USA and received further formation for spiritual ministries. She attended the Institute of Spiritual Leadership in Chicago and the Spiritual Exercises Institute at Guelph in Ontario, Canada. 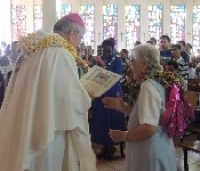 In 1983 Sister returned to the Solomon Islands and was stationed at Visale to direct Ongoing Formation programs for the Daughters of Mary Immaculate, the local congregation. She was also involved in Retreat Ministry and taught at the Villa Maria School. After a home visit in 1988, Sister returned to Honiara and became involved with the Family Life Ministry. She continued to serve there until 1992, when she returned to the USA and was transferred to the North American Province. She served as the Coordinator of our Lexington House, which at that time was a transition house for Sisters returning from overseas and for those having a short-term home visit. 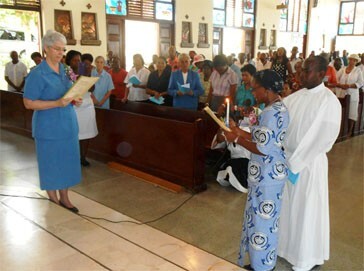 In 1995 there was a new call for Sr. Therese from the local congregation on Bougainville island to help with the initial and ongoing formation of the Congregation of the Sisters of Nazareth, in the aftermath of “the crisis” of rebellion and ethnic fighting that had gone on there for several years. Srs. 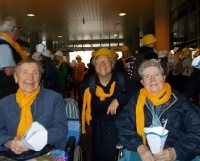 Therese joined Sr. Jeanne Perrault in Chabai, the headquarters of the CSN Sisters. 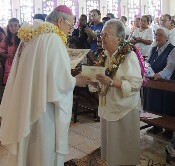 Besides her ministry to the Sisters, Sr. Therese also tutored students who had missed out on their years of high school because of the fighting. When more violence erupted Sister went to Goroka in the highlands of Papua New Guinea. Again she was involved in teaching students who wanted to complete their high school education. In October 1996 Sr Therese returned to the USA. She soon became the “Assistant Archivist”, working with Sr Gloria Fournier, and eventually took over the responsibility for the Archives, keeping records not only of the past, but of the important facts, dates, photos, etc. of the present Sisters, and sending needed statistical reports to the Generalate, the Boston Archdiocese, and other groups. Sr Therese learned the computer in her senior years to keep up-to-date with all these requirements. She would not be dissuaded from this work even when she needed a motorized chair to get her up and down the hill from “62” to the office building. Sr Therese suffered many different health crises in recent years, but her smile and her habit of putting the concerns of others above her own often masked the physical difficulties she was having. Her difficulty in breathing, however, could not be ignored. She moved to the Elizabeth Seton Residence in October last year and was well prepared to meet the Lord on March 9th 2014. We give thanks for you, Therese. May we follow your example.